Sara Ali Khan’s debut film in Bollywood, reportedly to be Abhishek Kapoor’s Kedarnath, is still a few good months away from release. Sara Ali Khan, though, it seems, has already arrived. With Saif Ali Khan and Amrita Singh as parents, and Sharmila Tagore as her grandmother, Sara Ali Khan already seems well acquainted with the Hindi film industry through familial connections. But that hasn’t stopped the 24-year-old from taking charge of her own career and bagging another film even before the release of her first – that too produced by Karan Johar’s Dharma Productions, and opposite Ranveer Singh. Sara seems to living a life that many are envious of, at the moment, but this young actor seems to be going about her own business and keeping it simple. Even with all the premature fame and attention that surrounds Sara Ali Khan, she seems to be unfazed. A huge example of Sara’s unaffected behaviour is the way she continues to dress. Sara seems to love ethnic clothes, and no matter how many international designers might be at her disposal, Sara’s favourite ensemble seems to be the good old Indian suit.Recently, post a yoga session in Mumbai, Sara was seen wearing a white cotton kurta and churidar set. She teamed her summary outfit with a pair of kolhapurichappals. Sara doesn’t seem to love just suits, but also the colour white. While reportedly heading out to Hyderabad for the shoot of her film, Simmba, Sara was seen in a white chikankarikurta with white palazzo pants and a matching dupatta, at the airport. A few months ago, Sara was spotted in Bandra, Mumbai, in a white kaftan style kurta paired with a white churidar and dupatta. And then, of course, there was the time when Sara paired her pretty white suit with a pair of even prettier gold jhumkas and a simple braid. 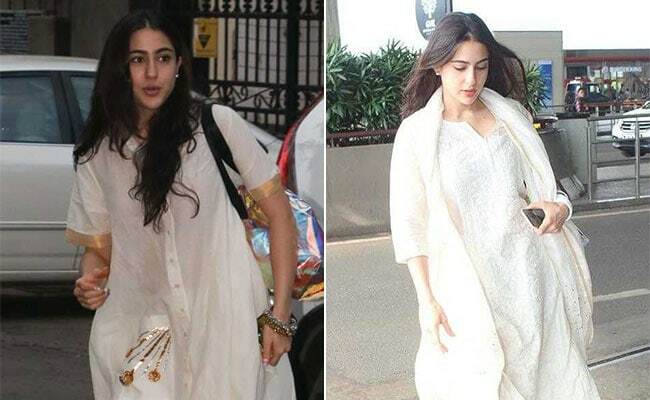 Loving Sara Ali Khan’s simple Indian style? So are we! Let us know what you think about Sara and her love for white suits in the comments section below.